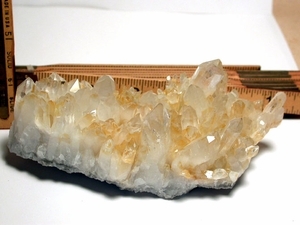 2-1/2"x 5-1/2"x 2-1/4" tall gleaming golden healer cluster from the Collier Creek Mine has another cluster of 3/4"x 4" layered into its sparkly sandstone base with multi-terminated tabular crystals, multi-terminated points and tiny clear gem crystals. Overall there are also milk, clear, and golden healer crystals, some with white titanum graphics. The tallest, brightly right in front center, is 5/8"x 2"and an extremely rare 8h faced crystal. Rainbows, twin crystals, one fleabite, and at least three crystals with uncommon 7h faces - this will surely be the center of your cabinet display.